Are human actors irreplaceable? Are they always better than CGI? In Priest, the communion-wafer thin, pseudo-religious vampire action flick from Scott Charles Stewart, it’s debatable: Obviously, humans have certain inborn talents that make them a director’s first choice when casting, say, people. They’re fleshy and hairy — and hair and skin are notoriously difficult to animate. Also, they emote. In an apocalyptic cartoon like this, however, a talented actor like Paul Bettany can actually be distractingly counterproductive: If his role (he’s a priest) were played by a robot, you wouldn’t wonder why, for instance, his homily was limited to lines like “Godspeed” or “God help us.” You often wouldn’t question why a Claymation character spouts press-one-for-character-development lines like, “I have questions … doubts … ” When you watch Bettany, you can’t help wondering why the hell a talented actor is stuck in such an ungodly mess. If the world-sweeping plot is ridiculous, the character-driven storyline is incidental. In an early scene, a family is murdered by a ravenous hoard of beasties: eyeless, doglike vampires who look like the unholy spawn of skinless saber tooth tigers and a Ring-hungry Gollum. 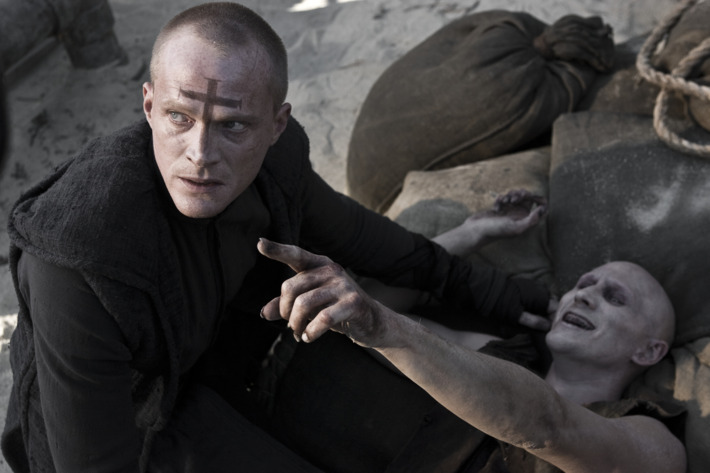 It turns out that the young girl who is kidnapped and the man who is murdered are the daughter and brother of Priest (that’s the only name given to Paul Bettany’s character, despite the fact that he is but one priest among many, and his colleagues must get wickedly jealous). When the Church won’t listen, Priest sets out into a desert called the Wasteland to rescue his daughter and destroy an entire trainful of vampires himself. The film does seem to speed by, though that’s less because of zippy plotting and more because it’s just short. About an hour and twenty minutes of screen time are barely filled with expert but unimaginative action sequences, silly bullet-time punches, and chases on motorcycles that go zooooom when the Priests press the “Nitro” button. At the end, one wonders, is it over? “No, it’s just beginning,” says the Bettany, and the scene turns just so corny perhaps no person could have saved it. So maybe humans are just distracting in some films: That line wouldn’t have been any worse, or any more ridiculous, had it been given to one of the vampires.